Calgary's got its mojo working! A recent poll on Canadians’ perception of Calgary (Calgary Herald, Dec 10, 2014) wasn’t very flattering. While Calgarians have tremendous community pride, we shouldn’t look at our city though “rose- coloured” glasses. However, at some point in time, we also must recognize our city can’t be all things to all people. In many ways, the results aren’t that surprising. Calgary isn’t going to appeal to people who don’t like winter - we have six months of it. Our city won’t be loved those who lust after beaches and water – the Bow and Elbow Rivers, plus the Glenmore Reservoir just don’t compete. Calgary doesn’t have great retirement appeal, as retirement dollars won’t go further here. That being said, many empty nesters will move to Calgary, largely to be closer to their children and grandkids who have relocated here to advance their career. Calgary is not a major Canadian tourist destination – Banff is! For some reason, Calgary and Banff have not been linked in the minds of Canadian tourists in the same way as Vancouver and Whistler are linked. Calgary is most attractive to Canadians of all ages who want to “work hard and get ahead.” In many ways Calgary is still a “frontier city.” Just like at the beginning of the 20th century when farmers and ranchers moved here, Canadians from the east are still migrating here to create a better life for themselves and their families. “Why the West has won Canada’s youth” was the title of Mike Milke’s (Senior Fellow, Fraser Institute) Herald column November 22nd, 2014. In it, he provided interesting facts about what he called “Canada’s young career class (YCC),” i.e. those 25 to 34-year olds who have finished their education and are seeking to establish their careers. From 2003 to 2012, Alberta gained 60,855 YCCs on a net basis; British Columbia gained 10,643 and Saskatchewan 581. On the “losing” side, Quebec lost 24,355 and Ontario lost 27,451. He didn’t give numbers for Manitoba or the Maritime provinces except to say “Manitoba and Atlantic Canada also bled young adults but that’s been a constant for some time.” If you do the math, they collective lost a whopping 40,000+. Calgary’s oil patch has been a magnet for Canada’s YCC for over 50 years - it is not a new phenomenon. Today, it is Calgary, Edmonton and Fort McMurray that are the magnets for young Canadians who want to establish their career, with Calgary being especially attractive for those wanting a career in Geology, Accounting, Banking, Brokering (stocks, land, commercial space) and Engineering or as I call them GABEsters. Calgary's mojo includes some great nerdy shops. Tourist love Calgary's laid-back urban culture. Since the beginning of the new millennium, Calgary has evolved significantly. We have become a better “Festival City” with Beakerhead and SLED Island being two key examples. We are a better “Foodie City,” often placing one or more restaurants in enRoute Magazine’s annual Top 10 New Restaurants and our chefs are regular medal winners at international competitions. Cowtown will also become more attractive to the YCC when the National Music Centre opens in 2016. Calgary is also a leader in new community planning with new communities like Brookfield Residential, McKenzie Towne, SETON and Canada Lands’ Garrison Woods and Currie Barracks. We have also become North America’s newest “Design City,” with world-renowned architects and artists creating work for Calgary – Calatrava (Peace Bridge), Foster (The Bow), Ingels (Telus Sky), Plensa (Wonderland sculpture) and Snøhetta (New Central Library). We’ve also got some of the best urban neighbourhoods in Canada – Inglewood, Beltline, Kensington and Bridgeland/Riverside. The Canadian Institute of Planners named Inglewood Canada’s Greatest Neighbourhood in 2014 and Kensington was a finalist. We are currently ranked #5 as one of the world’s most liveable cities (Economist Intelligence Unit) and #1 in Canada for family living (MoneySense Magazine). And, one thing most Canadians probably don’t know is that Calgary has been ranked the “Cleanest City” in the world (Mercer Global). Calgary has also diversified its employment base. We are now Western Canada’s financial centre and the distribution hub, which means more opportunities for YCC. Calgary has also become Canada’s leading political city - the Prime Minister is from Calgary and our Mayor is respected internationally. Many young Canadians come to Calgary for the job and stay for the lifestyle. I know that happened for us. We moved to the Calgary area in 1981 thinking it would be an interesting adventure never thinking that 33 years later we’d still call it home. Calgary has a bustling cafe culture. Yes, we sometimes live in our own little bubble. And, we can laugh at ourselves. In the words of iconic bluesman Muddy Waters Calgary has "got our mojo working, but it just won't work on you!" And really, do we really care what Canadian's think of our city? Florence with its 10+ million visitors annually is full of touristy places to shop, eat and people watch. You really have to dig deep to find the “real” Florence. As avid flaneurs, we are always on the lookout for locals who have a hipster, modern, funky or designer look about them, as they are good bets for having the best insights into the city’s true culture. Is there a design or galley district in your city. Are there any retro, second-hand, antique or used bookstores nearby? After 10 days of flaneuring in Florence, we found three streets that offer a more authentic Florence experience – Niccolo, Pinti and Macci. Yes, there are still lots of tourist traps on these streets, but there are also great local hot spots. Even though this street was just a block away from where we were living, it took us a couple of days to find it. As there are no cars, it is a popular pedestrian and cyclist route into the core from the edge of the City Centre. Here you will find several upscale shops (from kids to high fashion), bakery and restaurants catering to locals and off-the-beaten path tourists. We loved the three vintage/retro boutiques – Mrs. Macis (#38), SOqquadro (#13), Abiti Usati & Vintage (#24) and a funky hat and jewelry shop, Jesei che Volano (#33). Note the numbers in brackets are the street numbers, but Florence has a strange way of numbering homes and shops with different coloured numbers; even by the end we were not sure we had figured it out. The big flaneur find on Pinti was FLY (Fashion Loves You), which looks like a high-end fashion store, but is in fact a boutique run by students from the fashion department of the Florence University of the Arts. FLY has very trendy, well-made designer purses, jewelry and clothing created by the students. It also has some of the friendliest and knowledgeable staff we have ever encountered. We were immediately given information about other places to check out including their cooking school/restaurant on Via de Macci (more below). This wall of scarves at FLY had the feel of contemporary art exhibition. Mrs Macis is a colourful, playful vintage shop. Jesei che Volano is dominated by wall of hats on fish head hooks. On the other side of the Arno River, away from the main tourist traps, is an up and coming area anchored by Via di Niccolo, at the base of the hill to the Plazzale Michelangelo. Already home to several good restaurants and artisan studios, and lots of construction, it might be too late to call this a hidden gem, but it is definitely worth checking out. Vivaldi Cioccolateri (Via dei Renai, 15r) has a “North American meets Florence” atmosphere. The high-ceiling back room salon with an eclectic assortment of big comfy antique chairs and couches and classic music oozes relaxation. I had perhaps one of the best chocolate desserts I have had here - an unbaked chocolate torte, garnished with thin chocolate leaves. Though we didn’t taste the gelato, it sure looked good! And, while sitting enjoying your coffee and dessert, you can also enjoy some voyeuristic fun as the pastry chef’s kitchen is in the loft space above the salon. If you are into luxury and love shoes, a visit to the Stefano Bemer studio is a must. Here they make custom shoes from scratch and promise a perfect fit for both of your feet (few people have both feet the same size or shape). The front of the shop is both a showroom and workshop where you can see young artisans at work and view some of their samples (mostly men’s shoes, but some women’s flats). Don’t expect to walk away with new shoes; there is a six-month waiting list. Rumor has it Salvatore Ferragamo’s son buys his shoes here. Note: Be prepared to shell out 3,000 euros of a new pair of shoes, but this also includes the one time molds. We were amazed at how friendly all the artists in this district are. Don’t hesitate to go in and chat. They all speak some English, were happy to talk about their art and often had interesting tips on what to see and do in the area. Stefano Bemer's wall of foot moulds each with the names of the owner created a visual delight. Vivaldi Cioccolateri's cozy back room oasis. 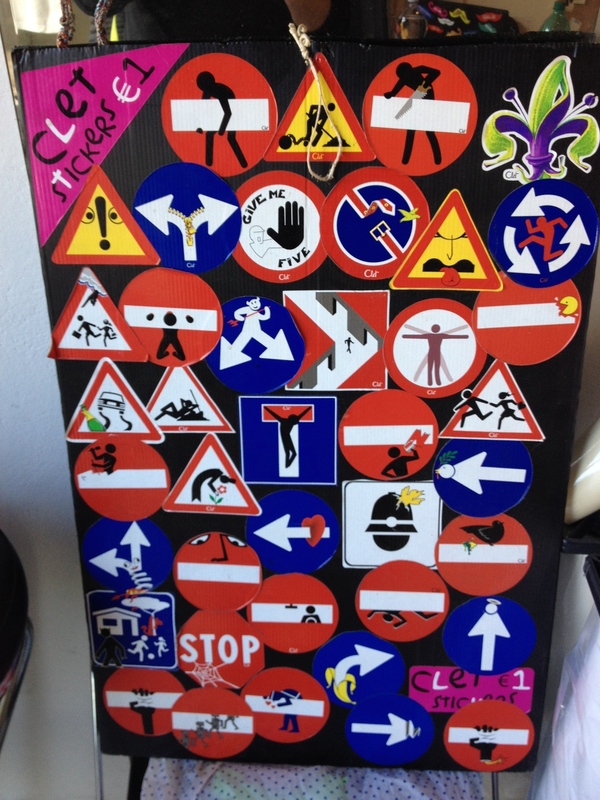 CLET is a Florence street artist who creates these fun street signs around the city, especially in the Niccolo District where he has his studio. We found this street after checking out the area’s Ghilberti Market. Here you will find interesting artisan shops like Ad’a’s Studio (#46) with a great selection of knitted and crocheted handbags, hats, mitts and scarfs made right on site. At the I Mosaici di Lastrucci (#9) workshop and gallery, you can watch amazing artisans painstakingly create amazing realistic mosaic artworks from very thin slices of different coloured rocks. The art of natural stone inlaid work dates back to 15th century Florence. This is truly is a walk back in time, when everything was handmade by local artisans. Danda Necioni’s (#27) is an etching and map shop that is literally jam packed with historic works – a great source for a unique souvenir from Italy. All of the works come with documented authentication, making them real collector items. Based on the hot tip from the staff at FLY, we lunched at GANZO (#85), the restaurant owned by the Florence University of the Arts and run by students. If you are looking for a break from dark spaces and ancient architecture, its bright white walls, contemporary furnishings and large black and white student photography provides respite from the dark and decaying places outside. The food is “stellar,” says Brenda. Her tuna steak on polenta cake with autumn pesto had us both wanting more. I loved my pumpkin puree soup with floating candied pumpkin; mint scented ricotta and an olive powder. The desserts were a work of art; mine a pumpkin tartlet and Brenda’s Sorrento lemon, Sicilian orange and tangerine scent mousse on a chocolate cookie base. Our sweet teeth were happy! GANZO: pumpkin dessert combined with salted caramel and balanced by the creaminess of goat cheese. Served in a cinnamon-flavoured pastry tartlet. Looks like a work of art to me! Ad’a’s Studio is a fun place to explore. Check out the surprise at the back? Can you believe this is charity/thrift store? We found Trattoria Ciacco after a morning of strolling one of the world’s longest flea market (3+ kilometers) in Le Cascine Park on the far west side of the City Centre. We were hungry. So we crossed the river, as that is where most of the people seemed to be headed and were willing to take more or less the first place we found. Lucky us, it was Ciacco! The place was full of locals but we were welcomed and took the only table available. (Note: if you are looking for a good restaurant, we always find the busier they are the better.) Noticing what the couple (our age) next to us ordered, we thought it might be a good idea to do the same (the only Italian menu board wasn’t helpful to two non-Italian speaking tourists). Again, lucky us, as it was pasta with fresh truffles and it was delectable. When our lunch arrived, the couple smiled and said “good choice” and we continued chatting getting lots of hot tips, including the name of another good restaurant popular with locals near the Piazza Della Passera called il Magazzino. The Florence University of the Arts also has a photography school which we visited thinking they would have a public gallery of student works. Wrong! But the staff was extremely friendly and we learned the university offers cooking classes for small groups. There we got two hot tips for restaurants – IL Santo Bevitore and Dilladarno. One of the great things about Florence is the vibe of its thousands of young university students. One of the first things you notice about Florence restaurants is that they cater to the students – many offering discounts. Every night while roaming the streets and alleys for on our daily gelato fix, we would run into a street where there were dozens of students all eating sandwiches and drinking beer or wine on the street. After a few nights we realized (yes, sometimes we are slow learners) this must be the place for sandwiches and indeed it was. If you are ever in Florence you have to check out All’ antico Vinaio located at 65/R Via De’ Neri. Flaneuring Fun in Maple Creek SK! Downtown Salt Lake City: More Than A Temple! One of the things I love to do when flanuering any downtown is take pictures of the reflections of buildings and people in the windows of the fashion boutique. This works particularly well in cities where there is a strong fashion culture as the fashion boutique window are often like mini art exhibitions. In Florence, the Via de' Tornabuoni is the high street for fashions with the likes of Gucci, Salvatore Ferrogamo, Tiffany's, Enrico Coveri, Damiani, Bulgari and Buccalllati calling it home. When Brenda said she wanted to go to the Salvatore Ferrogamo Museum, I secretly said "Yahoo" as it meant I would have some time to do some window licking on Via de' Tornabuoni. The literal English translation of the french term for window shopping is "window licking," which I have adopted for my practice of window photography as I am often so close to the window that it looks like I could be licking it. 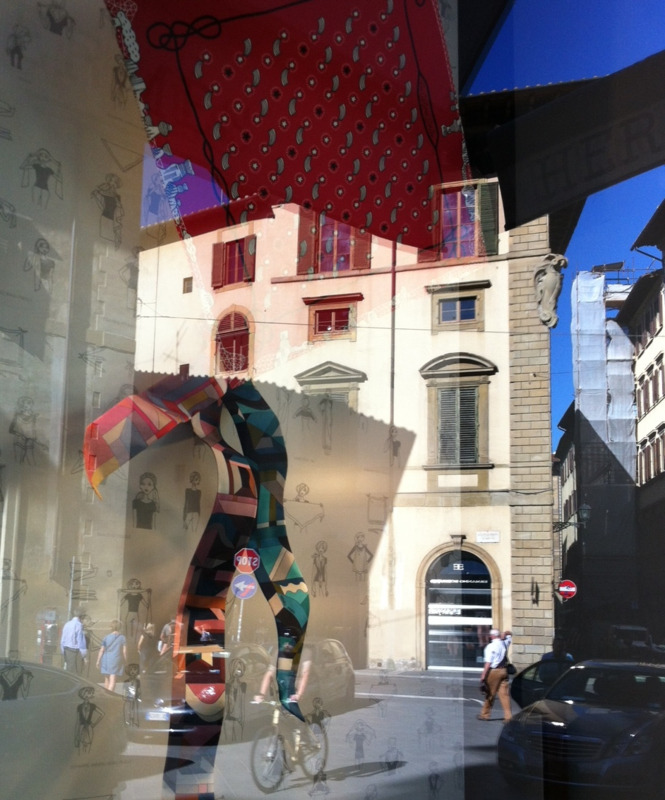 I have chosen these images as I feel they convey the diversity of visual imagery along Tornabuoni. I have also chosen not to provide captions as I would prefer the reader to study each image without my influence. I hope you will enjoy them as much as I did taking them and studying them afterwards. I have tried window licking in my hometown Calgary many times, but I never seem to get the same quality of images. I don't know if it is the light, the lack of quality fashion windows or just my poor luck. Almost everyday, I like to take some time to look at and reflect on my travel photos. The ones I seem to gravitate to the most art the "window licking" ones. I'd love to hear from you which one was your favourite and why? An everyday tourist lives every day as a flaneur or (in the case of a female) a flanese. An everyday tourist is a wanderer. Someone with curiosity, who seeks new experiences and has an eye for the road less travelled. We are freelance writers who love to research and write about all things urban.